Having covered server-side creation and management of device groups in the previous chapter, the next step is to explain how to perform the same operations from within a client app. Many of the concepts are largely the same in that the operations are performed using HTTP POST requests, though there are some additional steps and restrictions that need to be taken into consideration when taking this approach to device group management. Working with Firebase device groups from within a client app is primarily a case of constructing appropriately configured HTTP POST requests and submitting them to the Firebase cloud server. In common with server-side implementation, the client app also makes use of the sender ID when creating and managing a device group. Unlike the server, however, the client app uses an ID token instead of the server key when posting device group requests. Obtaining an ID token is a multistep process which will be outlined in this chapter. 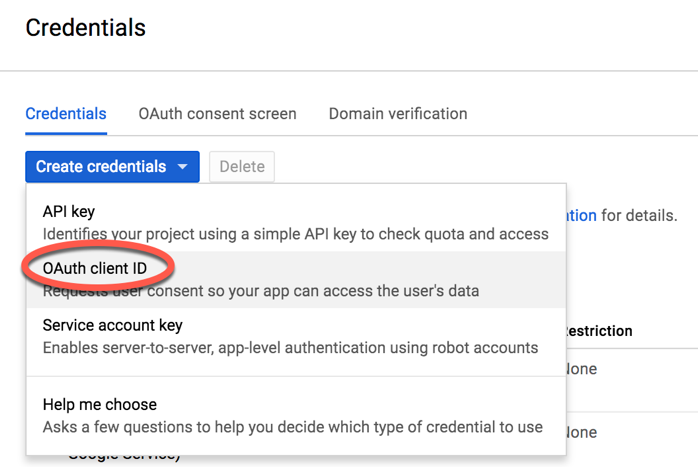 A key limitation of client-side device group management is that the user must be authenticated with a Google account within the app before the ID token can be obtained and any device group requests are posted. A further limitation is that the only notification name key permitted for the device group is the email address associated with the Google account. On the next page, select the Web application option and name the credentials “Firebase Device Group Example”. Although this ID is being used in an Android app, the web application option is selected here because the requests are still made using HTTP posts. Leave the remaining fields unchanged and click on the Create button. A dialog will appear containing both the client ID and secret. This client ID may be copied now or located later within the list of OAuth Client IDs within the Credentials page of the developer console. Make a copy of the GoogleAuth project folder, name it GoogleAuth_FCM and then open the renamed project in Android Studio. When the user successfully authenticates, the ID token will be available within the resulting Account object which is available within the onActivityResult() method. The Account object will also contain the email address for the user’s Google account which must be used as the notification key name when creating the device group. Compile and run the app and sign in using a Google account. Refer to the logcat output in the Android Studio Android Monitor tool window and verify that both the idToken and email address values have been displayed. If the idToken variable is set to null, double check that the client ID was generated for the correct Firebase project and that it has been entered correctly into the code. Tap the Sign Out button to sign out of the app before continuing. When the request is sent to the Google cloud messaging server, it will need to include the sender ID for the project. As outlined in the previous chapter, the sender ID for the project is available within the Firebase console. Within the console, select the Firebase Examples project, click on the gear icon next to the Overview heading and select the Project settings menu option. The HTTP POST request to create the device group will be performed using the HttpURLConnection class. Since the amount of time required to complete this operation will depend on the speed of the internet connection of the device, it is generally recommended that such actions be performed outside of the main thread of the application. Running the operation on a separate thread will avoid the app locking up while awaiting a response from the server. The doInBackground() method contains the code that will be executed asynchronously from the main thread and is configured to accept an array of String objects assigned to a variable named params. The onPostExecute() method, on the other hand, is called when the doInBackground() method returns and outputs the result (either the failure message or the notification key assigned to the new device group) to the logcat panel. When the method returns, the onPostExecute() method is called and passed the response string. All that remains is to create an instance of the AsyncTask and execute it, passing through an array containing the registration tokens of the devices to be included in the group. Compile and run the app and, if the user is already signed into a Google account, sign out and then back in again (as implemented in this example, the ID token is only obtained during the sign-in process). Check the logcat output to ensure that the userEmail and idToken variables are initialized, then click on the Create Group button. If the group has been successfully created, the notification key will appear in the logcat output. Copy the notification key, edit the send.js file created in the previous chapter and replace the previous key with the new one. Edit the remove.js file, and replace the existing notification key with the new key before running the script to remove the device group from the server. In addition to creating and managing device groups from the server, many of these tasks may also be performed from the client app. As with the server, the client app uses HTTP POST requests to perform device group operations such as creating a group and adding and removing devices. Device group management features are only available within apps where the user has authenticated using a Google account. This account is used to obtain an ID token which is used to authenticate the client when sending the HTTP requests. Unlike server side device group management, the notification key name can only be set to the email address associated with the user’s Google account. This page was last modified on 30 August 2017, at 17:44.